Good balance is crucial to staying fit and healthy. Take this one-minute balance challenge to see how you stack up! Whether poor balance stems from weak muscles, vertigo, or even medication, there are things you can do to work towards better balance – and it’s extremely beneficial. Here’s why it’s worth it to put in the time and effort to improve your balance. Use the following exercises regularly between balance challenge tests to help you improve your time. Strengthen your core, glutes, and legs. The strength of your abdominals, back, leg, and glute muscles are vital when trying to balance. To set yourself up for success, perform exercises like squats, lunges, and planks regularly to increase strength in these important balance muscles. Incorporate a balance board. Once you are comfortable with your basic strengthening exercises, practice them on a balancing board like a Bosu. Posture. Proper posture is crucial in all aspects of life and especially when trying to balance. Having good posture prevents muscular imbalances and injury, keeps the core engaged and strong, and allows blood to efficiently flow to the brain. Practice drawing your shoulder blades down your back, keeping your entire spine straight (including your neck), and engaging your abs by sucking your navel in towards your spine. Use the following tips while you practice balancing for increased stability. Take your shoes off and place your feet hips-width distance apart on the ground. Lift all 10 toes up and spread them as wide as you can. At the same time, firmly press down through the ball mounds of your big and pinky toes and your heels. Place your toes back down one at a time, keeping them spread wide. As you play with balancing on one foot, focus on keeping the ball mounds of the toes and the heel firmly pressing down into the ground. Practice shifting your weight. Before trying to balance on one foot, practice shifting your weight towards one foot and allowing the other to slightly lift off the ground. Then, try the other side. Close your eyes while standing. Keep both feet on the ground and slowly close both eyes. Notice if you begin to sway or lose your balance. If you feel stable, play with shifting your weight to one foot and then the other. Gaze point. Keep your gaze on one unmoving point for better balance. Find a spot in front of you on the ground, about 5 feet away, to stare at while you practice lifting one foot off the ground. Hip alignment. When we try to balance on one foot, we often pick the opposite hip up too high, throwing us off our center of gravity. Practice keeping your hips level as you balance on one foot. Breathe. Remember to keep a slow and steady breath in and out of your nose as you balance. Use a mirror. This is an easy way to ensure your posture is good and hips are aligned. 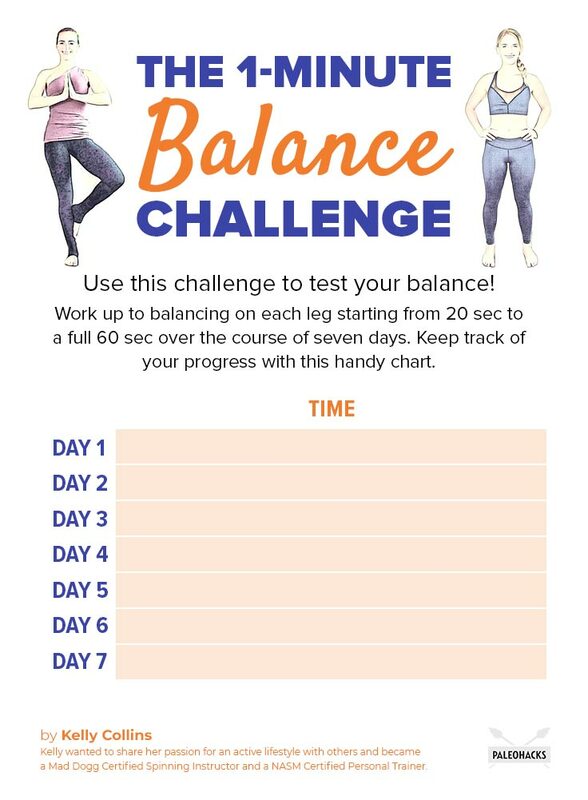 Use this challenge to test your balance! See if you can work up to balancing on each leg starting from 20 seconds to a full 60 seconds over the course of seven days. Keep track of your progress throughout the week with the handy chart below. We recommend trying the exercises above every day and retaking this test once a week to retain good balance. Set a timer out in front of you where you can see it. Stand with your feet hips-width distance apart. Engage your abs and squeeze your shoulders down your back. Place your hands on your hips. Find a gaze point on the floor about five feet in front of you. Then, slowly shift your weight onto your right foot, lift your left leg and bend the knee to a 90-degree angle. Hold for 20 seconds, then place your left foot back down. Switch sides. When you’re ready, try to balance in Tree Pose. Begin standing with your feet together. Bring your palms together at heart center and engage your abs. Shift your weight into your left foot, then slowly pick up your right foot and place it on the inside of your left calf. Hold for as long as you can, then record your time. 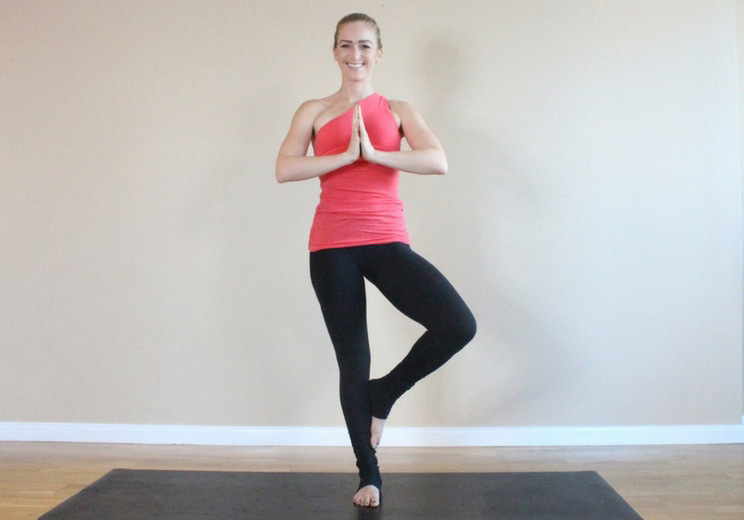 Switch sides, recording your Tree Pose time standing on your right leg.